Puppy care START HERE. Understand your puppy. Home / Blog / Puppy care START HERE. Understand your puppy. Puppy care starts with first knowing what it is your puppy is saying. To have a meaningful conversation with the puppy we need to be able to both send and receive information. For humans, this means using words…..and sometimes lots of them! Puppies use lots of words too but they create words using their whole body. From a young age, puppies start to learn how to use their face, body, behaviours and vocalisations to talk. Understanding their message means changing the way you take in information. See if you can take your dog’s whole body into account when translating their message. Sometimes signs of worry can be tricky for humans to notice and your puppies voice may not always be heard. Puppy care is most successful when you listen to your puppies needs. 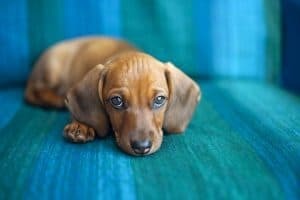 Read the list below to identify some signs of worry your puppy will use. Step 1: Worry signs can be due to pain or ill health. Your vet is your local dog expert and a great place to start investigations. Step 2: If worry persists despite physical health then Kalmpets can help. We can find the source of worry and help your puppy feel better.